My mom yesterday. It breaks our hearts to see her this way. Swelling is going down. The doctor is going to try and take the breathing tubes out today. She still has a high body temperature of 102 degrees; probably fighting off infections to her burns but she is getting better. Best luck and recovery Mamma Sue! Daly, do you have the address, etc for the Hospital she is staying at? Thanks, Dan. I'm going to e-mail you the hospital info. Keep the faith kiddo, she'll pull through okay! Thank you, Dom and Dolly. I appreciate your support and prayers. Oh, Daly. We'll be praying for your mom and your entire family. 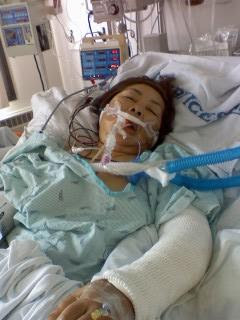 She is out of ICU now and in a regular room where she'll probably stay for two weeks. My sister lives in Seattle and checks on her daily. My dad is staying with my sister so he can check on my mom too.